Tried to break through my inertia today. Not a lot of luck but tomorrow is a new day. Mostly ate on track. Bought a 1 month unlimited pass for yoga at a studio closer to me I can walk to if my neck hurts too much. They open again on Saturday. Can’t wait to see kickboxing instructor again on Sunday. He works this saturday. 5am up walked dog to park. Progress as of today: 97.9 lbs lost so far, only 13.1 lbs to go! I really wish I could fit yoga into my life. Why is this so hard for me to do? Yeah. It’s a tradeoff and changeable... It’s been a long time since I’ve had even easy good friends to spend time with on the regular and he’s just such good company it’s not worth bailing over. I can’t seem to do yoga at home... only if I go to a studio... but it’s changed my life and vinyasa burns a ton of calories. 219.5 today. The scale is laughing at me. Sorry I have been MIA. Holy moly 6 days! How did I go that long without DD? Must have been the new muscle relaxers making me too foggy to track or post. Anyway skipped them last night because I just couldn't take being foggy anymore. 1) I am officially a size 12. Bought 2 pairs of sweatpants and a pair of jeans. Nothing fancy, just cheap basics... but they made me feel a million times better. 2) Had a second date with the hot kickboxing instructor. He took me to a matinee and lunch. We met up at 10, he went back to work at 4... and it wasn’t enough time. I could literally have spent a week hanging out with him. We lucked out on the table for lunch and got a perfect view of all the boats in the marina. We also walked along the canals. It was perfect weather and there’s nothing better than good company on a beautiful day. 3) Something to look forward to... Dog sitting for Christmas! That will be nice. To have some downtime. 4) Got home before my parents and had an hour to sit in peace and quiet with my dog. 3PM - Large chicken soup at El Pollo Loco, water. I forgot they add tortilla strips. Ate them anyway. If I am still hungry later I will eat an apple and some peanut butter. No idea on the calorie count. Dog sitting for Christmas - lovely! We've been missing you here! sometimes i get foggy and don't wanna post / comment either! LOL...glad you are back! yeah, i wouldn't hold off the tortilla strips either...love anything "tortilla" tasting...nachos, tacos, wraps...ohhh yum! and congrats on feeling better and fitting into a size 12! you've done a great job here since you started, losing slow and in a way that you'll learn to be your best self and keep it off! Grrr... Getting after it. Did lots of worthwhile things to be a functional adult again. I can do this. For the tally... A bunch of housekeeping things to get ready for the water to be turned off for 2 days tomorrow (city maintenance). Then I womaned up and handled personal business I have been slacking on. I am working every day to be worthy of the last 2 guys I met and was *almost* good enough for. Although... It should be noted... I did get a nice good morning text from the crazy hot kickboxing instructor. But he has not made plans to see me, lol. Did not keep track of my food today... getting a little lost without Rise so I need to restart that... Maybe next month. Breathe. One foot in front of the other. 9:42pm... in bed. Dying for the kickboxing instructor to text me again but guess not. Wait...no water for two days straight!? grated ginger! how cool. did you grate it yourself...? i have large pieces of ginger at home, haven't decided what to use them for, yet. It was better than I thought it was going to be... They only had it off overnight and now I am set to change that bathroom faucet! Ginger... I put it in the food processor and then freeze it in water to make ice cubes (nutrients oxidize otherwise) in a silicone ice cube tray with a lid. Then I can just drop a cube or two into recipes. I buy it in bulk to save. Plus I probably go through a couple pounds a month. I fell off track a lot. Need to pull it together. No water for 2 days??? What the heck?? Hey, are you being affected by the fires at all? Only with asthma, personally. Friends are. I’m kind of with you on that. 219.5... YAY. I'm not going completely off track while I get my paperwork together. Spent the day contemplating moving out. Friend from church needs a roommate and I offered her a temp sublet for a month or two so she can find someone... but it turns out she’s not renting the whole room by itself... she’s doing a sharing setup with multiple people in one room. She’s also trying to rent out her couch. Basically as many as 6 roommates at a time in a 2 bedroom condo. It sounds like escalating crazy and I don’t think it’s a good idea. She also doesn’t want anyone who is dating as a roommate. That’s not going to work, lol. Deleted all of the kickboxing instructor’s digital trail. It won’t work out... He doesn’t have his own place and I am on my parent’s couch still... and I’ve pretty much wrecked my life... so I’m not competitive enough. I’ll text back but I won’t bug him first anymore. He’s got more than enough going on without my complications. I need to give myself a hug, get up and get back on track. Got a lot done today. Real progress. Feeling pretty good about that. Onwards and upwards. If she's open to trying it out on a short-term basis, I think the month-long "stay-cation" sounds like an excellent idea. You might learn a lot about yourself during this sabbatical. Oh my, I didn't realize that's what your friend had in mind with renting out. No, I don't think that would work... at least not for me. I'm sorry to hear about Kickboxing Guy, but I trust that you're making the right decision for yourself. GOOD! I did it when I had a 90% travel job... It was cheap beach living, and basically like summer camp or a travel hostel... but that was fun and we all had real jobs with a few super hot teachers and fitness instructors thrown in. I have no idea what she’s going to do in an inner city area recruiting from a very conservative innercity evangelical church. I have a feeling it’s going to be a lot of crazy. And also I have a feeling that now that I did the CERT class, I’m going to be changing to a church that does the local CERT team or runs a tutoring program so I can be a free math tutor. I wasn’t feeling so great before so I wasn’t up to tutoring but I feel better and I’d like to get to know my neighbors. No weigh in today... Not enough sleep and forgot to do it. I did get back down to 220 over the weekend. Fell off track a bit with sleep, eating and exercise Fri night - Sunday... But I am back on track today. Got up at 3am and couldn’t get back to sleep... but I walked my dog to the park, drank lots of water, ate my oatmeal, and next I will bike to the store to get my dog her favorite bagels. Made some progress yesterday on paperwork. Getting back to being a functional adult. 6:30pm. Spent the day not terribly productive, except for 2 dog walks and a bike ride. Cannot get guy from Friday night off my mind. He is literally occupying all the available space in my brain. Those must be some pheromones... Or it was the secondhand nicotine. Geez. Who was OOMLG? What was so great about him? I don't remember. Something something. What did he even look like? Seems hazy. Fighting off the urge to down an entire pizza to bury inconvenient emotions. One foot in front of the other. Logging here as I go for "virtual" company as I conquer paperwork tasks that are between me and getting to know a super tall, super hot kickboxing instructor that thinks I'm adorable. Getting some exercise there...that's good. As long as you are back on track, that is what matters! Too late... I was too nerdy and showed that I like him too much... but that's ok. He is a smoker anyway. Big ego boost that I really needed though! Had a fun date tonight. We met up for frozen yogurt. Nice to go out with someone who actually likes me for a change. I’d see him again. He’s a big, good-looking guy and pretty good company. Catch (in addition to others but it is all a trade off) is that he is definitely more than just an occasional smoker... And that’s a little... gross. Nice that you met an interesting guy.........I can only say one thing...and that...there are no perfect people out there...so there will always be some give and take.....But happy that you guys got together!!! We’ll see. At least I had fun. Who knows? Ya know, I hear ya on the smoking thing, but take live in the moment with this. I'm a non-smoker, but I'd take a smoker & have someone to do things with over being lonely. 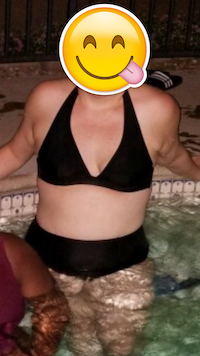 PS I keep forgetting to mention this but your bikini picture - WOW!!!!! Thanks! It’s amazing how bodyfat percentage matters more than weight on the scale. smoking thing is bad. and soooo many people do not smoke anymroe....fine to date him, but it'd be a dealbreaker for me for sure. as it only leads to illness and sickness. I feel you there. Wasn't in his profile. Fell behind on commenting and reading logs... Will get to that over the course of the day. So glad I have DD and folks here to help me "think out loud". Having an "overwhelmed", "irritable" and "short tempered" day that started last night and is continuing today because I haven't done the personal life stuff I have needed to do the past couple of weeks, plus I have this dull, constant pressure in my neck. Giving myself a hug and getting back on track. OT today. I didn't do any of my homework so I called and asked if I should still come in, and she says yes. I want to bail on my PT appointment today because A) every time I have seen him he gives me a 3-4 day headache and B) I don't think our teamwork is there. I definitely get the sense from him that he doesn't think I am going to actually feel any better and seeing me is a waste of his time. Yesterday I spent the rest of the day working on my app idea for my portfolio (5+h), then about 5, realized I needed to fix my classpass account, so I could go to Yoga but couldn't figure it out and got overwhelmed. 7 realized I was hungry and my dad came out looking for food... Got into friction with him*... So I gave up and took my dog for a walk... Which was smart. When I came back, I spent the next 3h making food, washing the curtains I had taken down, setting up the dining room, feeding my parents, cleaning up from dinner, putting the other half of the chicken on and then putting it away in single servings. Got to bed about 10, but couldn't get to sleep till midnight. At least all my food choices were healthy and on track. This morning I woke up with my alarm about 5 and should have taken my meds but I was too groggy and hit snooze till 6. I got up, showered, dressed, and started picking up more of the mess**, trying to figure out what to eat... because I had a protein shake and oatmeal but really wanted eggs... and got into conflict with my mom because I asked her to do a research task***. My dad came out and started making eggs so I asked him to make me some too and the whole thing turned into an out of scale conflict****... I took over making eggs and toast*****, fed parents, and at that point I just started responding "I need a time out" to every request and question. Somehow they survived the next 3h without my help. I gathered my thoughts, took out the trash and the recycling bins for collection, and started sorting my paperwork. Also wrote this post. 11:16 now, have to leave in 30 min for OT and PT. Not sure it is worth the driving risk, time and gas. Going anyway. At least all my food choices were on track. * = He wanted to eat right then not in 30 min. He wanted to eat together in the dining room, but it wasn't set up yet. ***= My mom won't let me fix the bathroom sink without a plumber to call. It's been over a year. I asked her to find the number of a plumber she wants to call. She got angry that I wanted to fix it because she feels like she has no control. **** = There was a pan from the chicken soaking overnight because the foil tore and things got burned on and he didn't like that there was a messy pan... He wanted cheese for the eggs and I don't buy cheese anymore so I didn't have any. He wanted tomatoes, but when I pulled out the tomatoes they had gone bad and I wouldn't let him eat them because he got sick off a bad tomato a couple of weeks ago... He couldn't remember when, so I said, "Remember it was my birthday and you got really sick from that tomato so we didn't do my birthday?" and then he couldn't remember and felt bad so he bailed on making eggs and so I had to make them. *****= While I made eggs, he found more things that he thought I should take care ofI am gathering electronics for recycling and he thinks they are valuable and should be sold on ebay. Nobody wants a broken printer. He was going through the pile and talking about how they are worth something. Then my dog started doing something he got anxious about. The dog is fine. Nothing was wrong. But it was more than I could process at the time so I shouted "One disaster at a time!" louder than I meant to... it instantly feels like I kicked a puppy so I feel worse. Yeah... no idea what to do about it all. You will get through this. You are doing a great job. You show us everyday how strong you are. Aaaaaaaaaw. Thanks for the pep talk... I really needed one today. 223.3. Still up but I think it is sodium and the 2/3 of a small frozen pizza that is sitting like a rock in my tummy. Feeling a billion times better today. Not sure if I am more productive... but I feel more together. Make and eat meal 1... espresso protein shake... wait for fog to lift. Gave dog pain meds and vitamins. Changed her bedding. Hormone balancing stuff may be starting to work. She didn't pee last night. Make meal 2... oatmeal. Realize it won't work because it is steel cut oats and I didn't set them up the night before and they will take time to soften up. Make everyone breakfast instead. Pancakes, sausage, apple cranberry compote. Deal with dad's tantrum over me not paying enough attention while I am cooking. Deal with dad's second tantrum because the dining room isn't back together yet... that part of the rug was extra wet and is still drying. Deal with dog's tantrum because I am making pancakes and sausage and it smells good. Put away 4 sinks of dry dishes. Wash all the new dishes. Wipe down all the counters. Take a 30min break to rest my neck because Legcramps says I'm not being lazy if do that. Set Bearcountry's timer because I am taking a limited break. Get inspired to use a no code app platform to "think out loud" about my pricebooking app idea... that I just can't get out of my head to think about other things. Did a little lite research. Get inspired to install updates to my computer... which will take an hour. Time to get up. Made lunch... turkey burgers, kale slaw with cranberries and sunflower seeds, sweet potato oven fries. While lunch cooked in the convection oven... Cleaned the toaster (horrifying). Is that a good use of 5.5h? In other news... no texts from OOMLG. Because he's Out of My League Guy... and not really interested, just lonely. Super fun reminder that I'm not good enough for someone I really liked. As DDP says in his Motivational Monday... Discontent is the foundational block for change. New candidate popped up yesterday on JustOkCupid. Tall tattooed skinny 40yo who manages a small apartment building, teaches kickboxing, and doesn't drink (a little AA he says, good for him). Seemed to think he'd get rejected because he's not drinking and was in AA. My take on it is that everyone at 40 has something they are trying to reset after... no matter what. Besides... It's not like I have a lot more to offer than he does right now. I'll be totally out of OOMLG's league. And tell him... I don't know... you live an hour south of me... You're not a billionaire... Plenty of fish in the sea. TY! I think this is the first pic of me in a swimsuit I've been happy with since I was 5.
wowwwwwwwwwwwww you look AWESOME girl!!!!!!!!!!!!!!!!! looking GREAT. the suit fits your body perfectly to the T! also, your list is VERY detailed ! lol, good job keeping track of EVERYTHING you did! i tend to want to list everything here i do in a day, never have, ....you beat me to it! Thanks. Trying to figure out where my time is going and why I'm falling off track... as Graindart pointed out... only 2.1 lbs from a milestone. 219.7 yesterday but 223.1 today. Aaargh. But it is probably sodium because my mom took me out for pho last night to say thank you for cleaning the carpets. Missed GP appt this morning. Wasn’t ready to go first thing AM and just fell off track. As OOMLG says, give yourself a hug and help yourself get back on track. So I am. Rebooked for next thursday. Washed 2 more sinkfuls of dishes. Took a shower, blow dried my hair, put on a nice outfit. and worked on reassembling the house from carpet cleaning. Breathe. Relax. Unclench. Om. All things can be managed and put back together. I should get out of the house for 2h, per OT instructions. Unclog my brain. Proprioceptive input to help my brain focus. Auto-reflex desire is to go to the 99cent store and get a burger but I shouldn’t drive... neck is stiff from carpet cleaning. Bike maybe. Ended up spending the day reassembling the house from carpet cleaning. Part of it is that I just can’t think when there is clutter... And it was way worse than normal because I moved everything around to flip the rooms and get beds and furniture away from windows so there is just a lot to put in place... But mostly it wS to distract myself from kicking myself for missing the GP appointment. Eventually went with my mom to Aldi’s to get out of the house. She drove. I was a good passenger and just kept my eyes closed the whole time. Came home and brain kicked “on”. I think the OT is right. Out of the house first thing AM whether it is productive or on task or not. Also... What is the big deal about Aldi’s? It’s all packaged foods? Nice of your Mom to reward you for all of your hard work! One thing at a time Ms. Happy...and try not to overdo too much !keep up the great work on your part to living with your parents and helping clean the home! Nice that you cleaned the carpet, and nice that Mom took you out for dinner to say thanks! Good bonding time! Make sure you get enough rest from all that cleaning. I thought cleaning was active rest? Thanks, that makes sense. I feel like if I don’t move or do anything I am wasting minutes I cannot get back... Like if I am not tired enough to sleep, I should be doing something positive. Thought about it more. I think you're right. And I have to consider anything that works my neck as active right now. Including sitting up. I love Aldi for packaged foods. Some of their fresh produce is good too. Great place to pick up dairy. Yeah... I wandered through that store and literally thought to myself... wow... I would get a red flag on all of this from the nutritionist on Rise... It''s all inflammatory foods that cause tension headaches. I don't eat any of this stuff any more. My Aldi purchases were chicken breasts, a pound of raw ginger, a bag of kale salad, and some celery. Also 2 frozen pizza. I did it. I can’t believe I did it. I cleaned the rugs inthe living room/dining room, hall, and my dad’s office. And I got the rental back on time. And I remembered the receipt for the extra cleaner I bought so I could return it. I did it. OMG I did it. And I am not going to die of exhaustion. And I do not feel a headache coming on. I did collapse on a Big Lots couch for about 30 min till I could drive again. OMG. They have my favorite frozen pizza. I am not buying it. I deserve a reward, but I deserve better than frozen pizza. I deserve bottomless steak. I deserve whiskey. I deserve... A hot boy toy. Oh look, OOMLG texted me from Houston. I adore him. That's a good job to get behind you!........Cleaning carpets has never been a favorite of mine.